In the morning we went to the laundry to pick up our clean clothes. The tuk tuk driver turned out to be the same that took us there last time, so he knew where to go. When we got back we had breakfast, and checked out of the hotel. We were picked up by a tuk tuk at 11.45 AM, and after some paperwork at the dock we left Phnom Penh in a speedboat at 12.15 PM. We shared the boat with an Australian couple and Portuguese couple. 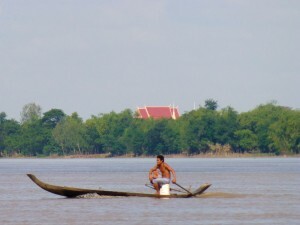 It was a lot to see on the trip down the Mekong river to Chau Doc. 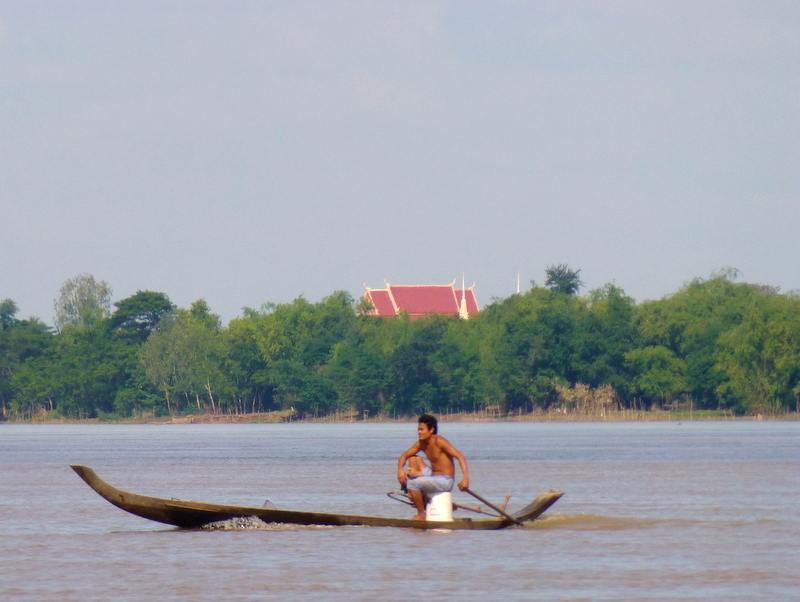 Temples everywhere, small boats, big boats, daily life along the river, farmers and fishermen. We had to go a shore twice to pass the border, first to leave Cambodia, then to enter Vietnam. We were lucky, and were the only ones there, so it didn’t take much time at all. We arrived in Chau Doc at 4.30 PM, and left the boat at Victoria Hotel’s private dock. The other passengers had done some more research than us, and booked cheaper hotels. We just accepted the suggestion from the travel agent, and didn’t know that we were staying at a luxurious colonoial-style riverfront hotel. But since Fredrik had a flu, it was nice with a bit of luxury. We were welcomed with cold wet towel and a cup of tea, and told that we had been upgraded to a room with a view over the river. It was large, stylish and very comfortable, with timber floors and a French balcony. 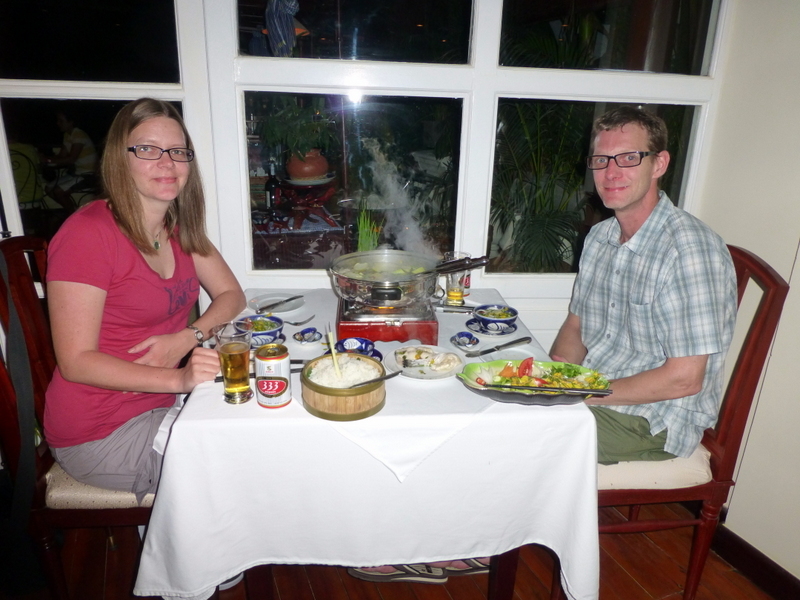 Our guide book said that they also had the best restaurant in town, so we didn’t bother to go anywhere else. We ordered Okra hot pot, which turned out to be fish and vegetables cooked at our table. Very good! After dinner we had a beer at the terrace, watching the lightning all around us. It was blinking almost constantly. So Gunnhild went out to find an ATM and get some Vietnamese money, and got back just before the rain started. We packed what we needed for the boat trip in a backpack, since we didn’t expect our cabin to have room to open two suitcases. We were right.